Lovers, to the left take a gander at Steve Madden’s glamorous Geema Clog Booties; on the right prepare to marvel at Charlotte Russe’s Multi Strap Studded Bootie. Though the ravishing Russe pair is a classy cognac hue as opposed to the gray (or black) of the glamorous Geema, and is crafted out of faux leather instead of real; for a mere $42.50, in comparison to the $199.95 of the originals, they are every bit as capable of adding a bit of boho belle allure to your look du jour - at a price that the fabulous frugalista that is vous couldn’t possibly resist! Tell me, kittens…will you be a big spender and go for Steve Madden, or be thrifty and spring for Charlotte Russe? Thanks to Steve Madden and Charlotte Russe for the pictures. I find Charlotte Russe's shoes to be soo comfortable but they are made cheaply. Still I will choose Charlottes! Totally awesome matchups..but today, we need snow boots and anything possibly warm for feet here. We've had a miserable blizzard. Just wanted to stop by and say hi! It's so nice to come back to your blog after my mini hiatus and find yet another amazing steal I want!!! :D I definitely love the Charlotte Russe pair! I like the color of the Steve Madden ones better. Charlotte's would do me great. I'm glad you found an inexpensive version. Yeah! So gorgeous. Great price too. Those are so identical,have to steal on these! The Charlottes are perfect and they're a nice fall color, too. I would definitely buy those. Ohh a really tough one today! I am such a Madden addict, but the Charlotte Russe pair is gorgeous, too. I truly don't know which way I'd go on this one! I prefer the brown color, and like the nailhead trim on the shoe, so I'll go with the Russe. My favorite is the Charlotte Russe. I actually prefer the Charlotte Russe, so I would go with those. Adorable shoes! I think the campbells are gorgeous! Thanks so much for ur comment sweetie! I have to go with Steve on these -- I love the gray! heck yeah! i love these. Ooo, clogged boots: What a perfect combination. 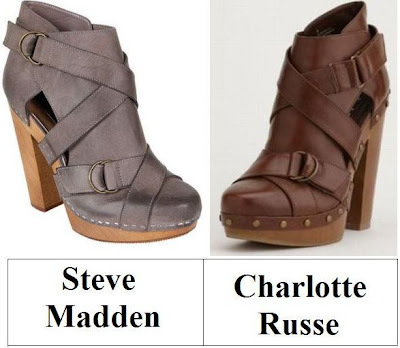 I will always prefer Steve Maddn over anything else, hehe, but I do love the Charlotte Russe's colour. I love those boots. But maybe a little cold for winter? But who cares? They are lovely! i'll have to go with the steve madden ones, they are beautiful! I like the color of the Charlotte Russe pair. I'm gonna say Steve Madden, just because I always have good luck with that brand. Not a big fan of that little stud detail on the toe of the CR's, either. Not liking the look of either of them, but I'll go with the Madden pair because it reminds me less of clogs. Oh my gosh these are tooo cute! I want both pairs haha. I actually really wanted to know how good are Russe shoes becuuse they're quite a steal for the prices they got and the various offers! Oh wow, love the steve maddens, the grey is nice! Not huge on the clog trend, but I like the color of the Maddens better. That said, if I were to be a clog fan, I'd probably go for the Russe ones... the Maddens are too pricey considering this probably wouldn't be an investment for most gals! Wow, isn't it usually Steve Madden that's knocking off designs? ;) I'd go with the CR's on this one! I bought my wedding flats at Charlotte Russe!! And my mom would love these...she loves clogs! Hope you had a nice weekend! Charlotte Russe does the BEST knockoff shoes and surprisingly aren't uncomfortable. hmmmm very hard decision! I would probably go for broke and get both! Nice & fun loving blog. Check out my Great "Wool And The Gang" Give Away! Hey lady! I'm running a small giveaway over at my blog! If you get a chance give it a look! Lovin' the Steve Madden version. Wow, they look almost exact! I love Steve Madden shoes though, are Charlotte Russe shoes comfortable? I actually think I like the CR color better! I love boots in winter! Although they look almost identical, you know me... I have to go for the Steve Madden pair! I just can't resist his shoes! i love the classic cognac color and the studs at the bottom, so i'd be thrifty with this one and go with the pair from CR. they're awesome. i'd choose the steve madden ones. mostly because of the color.. but then again i wouldn't have those in my budget right now..
ooo la la! I'm usually pretty anti clogs, but these are a nice balance for someone like me! I have to go with the Steve Madden's I think!